It seems that the Land of the Free has retooled its foreign policy to mirror this B-movie dialogue. Perhaps this is an expected outcome after decades of standoff with the USSR and the ever escalating war technology. During the cold war, the visible antiwar movement lost its momentum. The U.S. was building the bombs but it wasn’t dropping them on anyone. The war technology kept ramping up as a “deterrent” and we learned that, as treaties increasingly called on the U.S. to be the defender of allies and the police force in “problem” places in the world, the U.S. could stand on the neck of almost anyone and bring them into submission. This isn’t right or righteous, this is tyranny. 20 years ago, a small group of people recognized this growing post cold war pattern. Antiwar.com was born to collect and curate news and information that exposed this growing predilection for U.S. aggressive action in foreign land. Today we are harvesting the bitter fruit of this policy with increased terrorism, suitcase bombs, increased paranoia and burdensome security measures, loss of privacy, warrantless phone taps and other infringements of our rights here at home. Right now, Antiwar.com is sounding an urgent call to action. Foreign activity is high and we don’t see an outcome where any new President will alter the current course. We need a loud and persistent voice that says, “I’m Already Against the Next War”. A few weeks ago, Antiwar.com launched a brand new activity site: Antiwar.me. Here you can find tools and techniques for being a part of that persistent voice. You can join their social media Thunderclap, download free social media images and get great premium gifts for your financial pledge. Antiwar.com is a very lean organization and relies on contributions from readers and supporters to fund their original journalism and commentary and now the activity site. Even a $20 donation is much appreciated and earns you a limited edition red poppy pin. The days of large peaceful sit-ins are gone. Now we can express our protest in a different way. After less than a month, the Antiwar.me thunderclap has already achieved over 500,000 in reach. Let’s reach millions while sending a strong message to the President- “I’m Already Against the Next War”. 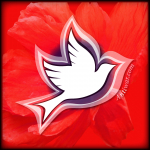 Please visit Antiwar.me and join the free Thunderclap and consider a poppy pin or pledge a different amount so Antiwar.com can continue its efforts. The bipartisan consensus for reckless and dangerous foreign policy requires constant alertness. Antiwar.com’s original content coupled with links to the best foreign policy writings around the world provides a one-stop site for keeping abreast of the violent inhumane policies which endanger the very principles upon which the United States was founded. Please donate today so they can continue to deliver the most comprehensive news and opinions that track the latest moves of the War Party. And the winners are… #AntiwarHaiku Bitcoin Black Friday @ Bitcoin Not Bombs!